Don't let a storm cloud dampen your advertising efforts! With this reusable rain poncho, staying dry on the go is no problem, no matter what Mother Nature throws your way. This handy rain storm essential features solid color 3.55 mil PVC material for the best in impermeable outerwear. It folds neatly into an included PVC pouch that will feature your brand in color imprinting. A versatile one-size-fits-all design makes connecting with valued clients, customers and colleagues easy. 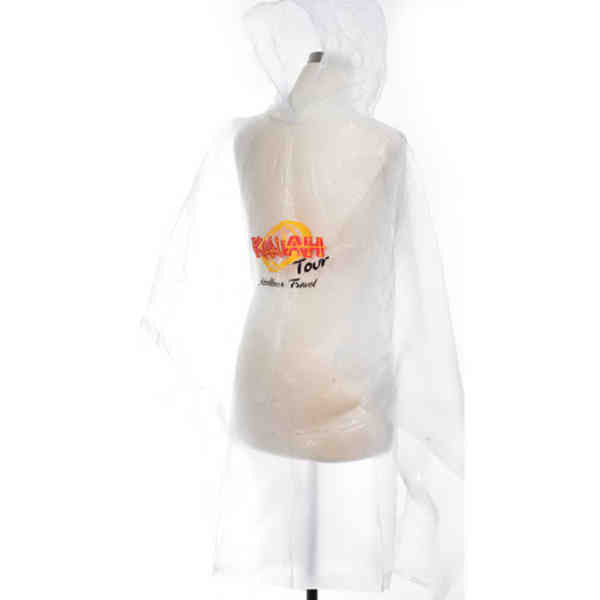 Whether it's a drizzle or a downpour, these promotional ponchos are here for you!. No special pricing, promotional programs or less than minimum available for this item. Size: 50 " x 80 "
Price Includes: Per change. Plus applicable art/set-up charges.